Revisit memories of a beloved beach with this bracelet that holds sand gathered from your favorite shore. Escape to your favorite summer getaway with the Sand Dollar Bracelet, handmade from sand gathered from your choice of one of thousands of picturesque world beaches. Jewelry maker Holly Daniels Christensen sets a pinch of sand from your cherished seaside spot in silver bezels sealed with jewelry-grade resin. Organic and utterly modern, they're a unique sculptural way to add a tangible reminder of a laid-back, sunny day at the beach to an occassion that's more polished. 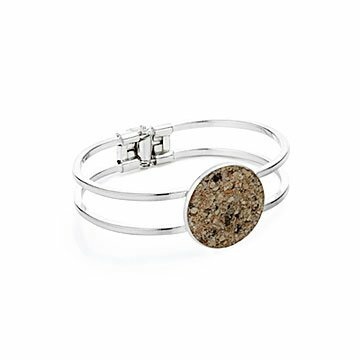 Handmade in Massachusetts, each bracelet comes with a card that indicates the source of the sand. In response to our customers' requests, we are happy to offer you the option to send in your own sand for a more personalized bracelet. If you choose this option, you will be sent a convenient mailer with instructions. Even more beautiful in person!! This was a gift for my sister. She and her family live 1200 miles away and it's not often that we see each other. Every other summer our families rent a beach house on the OBX and spend a blissful week together. I wanted something that would remind her of our families happiest moments. My sister loves the bracelet and said it's the most thoughtful gift I've ever given her and it made her cry. It is beautifully made and is solidly constructed. It was the perfect gift for my Mom because it allows her to carry a little bit of her favorite place with her when she wears it. I only wish this version came in sterling silver. Wife loved it . . .
My wife wears it and loves to tell the story of the sand enclosed. Purchased this as a gift for my MIL who is a true beach bum and generously takes me and my husband on a beach vacation each year. I loved that the tiny town where her beach house is located was represented in the large and detailed "sand bank." The jewelry itself is solidly constructed and the sand accents the silver beautifully. Perfect gift for my sister. Will order from this company again. The artist took the time to sort through the sand I provided and pick out interesting shells to include in the bracelet. Much appreciated!